Very interesting. This could easily be longer list (six or eight nights, that is.) "Libeled Lady" would have been a much better choice than "I Love You Again", IMO. You may be right about that. Perhaps I LOVE YOU AGAIN is a favorite title of the TCM programming department. I do think they could've picked a better film to showcase Lucille Ball's comedic talents. FOREVER DARLING was a flop and is not very entertaining. Something like MISS GRANT TAKES RICHMOND, THE FULLER BRUSH GIRL or HER HUSBAND'S AFFAIRS would have been better. She was funnier in her Columbia comedies. As an overall comedy Libeled Lady (one of my top 5 30s comedies) would be a much better choice than I Love You Again, but as for a movie that features Loy as a comedic character, not so much; In Libeled Lady, Harlow is the funny one, while Loy plays a mostly straight role. Of course Loy mostly plays a straight role in all of the comedies she was in, but at least in I Love You Again there isn't another lead actress playing a comedy role. Nice list of some that didn't make the cut. 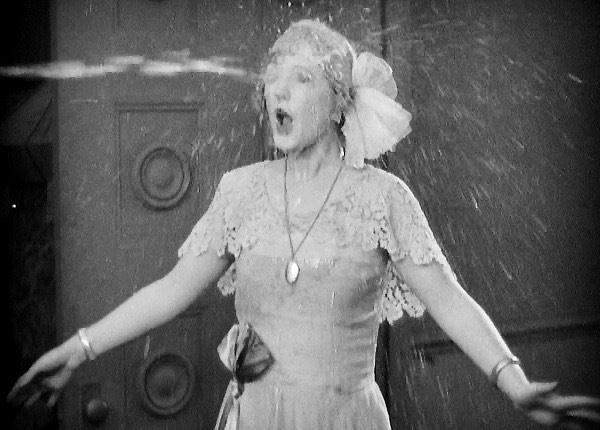 Seeing ZaSu Pitts reminded me that Thelma Todd was missing. They could have featured Todd with either Pitts or Patsy Kelly. I see a couple of repeats from this month. I would like to see TCM play any one movie, a maximum of four times in a year. Each one of those times in a different six hour window. I have read where TCM does not own the Turner Library (exactly) and must lease movies. I have to believe that is why movies get so many repeats. Ah, the topic of why 'so many repeats'; This is one of the hot button debates that has occurred at this forum for many years now. I don't think it related to the Turner Library (which is owned by TCM's parent company, WarnerMedia, which is owned by AT&T); While it is easier and cheaper for TCM to lease films from their parent company, that 'library' has so many films, I believe TCM could show a film only once per year and still not show all of the films in the library. As for leases from other truly outside companies \ studios (e.g. Fox, Universal), it is my understanding these leases often have set requirements with regards to broadcasting of their leased films; E.g. TCM gets a bundle of 10 Fox films, including a major one like Laura, and they are required to show all films in this bundle X number of times over a Y period of months. Anyhow my bottom-line here is that I believe TCM shows 'so many repeats' because they believe that is what the market place wants; Popular and well known films, and those that feature so called major stars, from so called major studios. So of course for us old-timers that have watched TCM since their start in 1994, will say 'what, that again, I have already seen that 5 times!'. I don't think we should be dwelling on repeats in this discussion. We should be looking at the creative way the programmers are honoring women in Hollywood, which they like to do every October or November on TCM. Plus these are, for the most part, great classic films with great performances. Women comedy stars at the top of their game. That's the main point. I agree 100% and I'm glad TCM did this tribute. That being said as we have discussed tributes tend to show 'hit parade' (well known \ often shown) type films. Therefore next year I recommend another tribute to the funny ladies; Funny ladies - unsung gems. E.g. instead of The More the Merrier, show If You Could Only Cook. Nice idea. If you noticed they did sneak in the 30s Paramount comedy COLLEGE SWING which I believe will be a premiere on TCM (to showcase the talents of Martha Raye & Grace Allen). So every now and then they do play a rarity. I'd still like to see more Republic films on the channel. I pay extra to Xfinity/Comcast for TCM. It is $9.95 more per month. I watch TCM and INSP. So that is $5 per month for TCM. I respect what you do on this site very much TopBilled. I resent, after only five years with TCM, to watch movies over and over again. These are mostly films I have never seen before TCM. Some day soon, it will be goodbye TCM and hello FilmStruck. It should not hurt at all for me to have an opinion. If FilmStruck does themes to assist me, that is wonderful. I mostly watch TCM in real-time, seldom DVR. My $5 is not doing so well. Thanks for the kind words. As well as the respectful tone of your post and the way you explained your point of view. But I would like to say that sometimes we miss things the first time around. So maybe catching a film a second or third time helps us see new things and bring us a deeper appreciation of the story. Believe it or not, I've seen CITIZEN KANE at least 20 times and still find new things in it. I do agree that it would be nice to see more films on TCM that come from Universal, Paramount and Republic. You don't want to know how many times I've watched Victor/Victoria, my favorite of all movies. I simply believe there is a way to get more movies to those of us who enjoy variety. I do appreciate what you do. I also believe you work with the material TCM gives. It could improve. I was AMAZED recently when a whole day was wrapped around silent films. As CaveGirl would say, you can't be a real fan of classics without them. I get over 200 channels with my Xfinity. Funny, TCM seems to be one of a few that entertains me. TCM should already know that we LOVE our channel. I don't mean to be nasty. I just think TCM could kick it up a notch gently. No one expects the impossible. Just a little more. I would love to see more stars we may loose soon, get interviewed by Ben and company. In the magnificent list you make in the first post, it just might be less than a handful of people are still living. It's good to balance what one watches. A person who relies solely on TCM's monthly offerings will probably miss excellent films from studios outside their library. Universal Pay Television puts many classic westerns from Universal and Paramount on Starz, which I stream. Those films never air on TCM so it's a treat to be able to see them. Also the public library is a good way to borrow DVDs of movies that never or seldom air on TCM. Movies from Republic or Paramount that Olive or Kino have put out on disc. Plus as you say, FilmStruck, which I believe is part of the parent company that owns TCM, has a variety of other films-- like foreign titles that have been restored by the folks at Criterion. I am picky at 61 years. Mom is more picky at 84 years. We watch too much TCM, but the other channels are lacking in the good stuff. A Comcast tech is coming today to checkout our ongoing sound level issues. Getting Mom to move to streaming, which would work for me, may not be so easy. Today could make a difference there. Hey, do you stream TCM? If so, do they offer both live and on-demand? I have noticed five streaming providers which have TCM. I believe it is only an option with Sling TV, but providing a low cost "skinny bundle" is their MO. The other four include it. The latest from AT&T is "Watch TV." It is their bare-bones package at $15/month. It too has TCM, which makes sense now. Moving the tally to six. Yes, probably Sling is the best bet. A few other posters use Sling to stream TCM. And it does have an on-Demand feature I believe. I think this sounds like a great theme! I do too. They really came up with a good one this time. I bet if they did one on Funny Men they'd feature people like Jerry Lewis, Buster Keaton, Harold Lloyd and Red Skelton. As for if TCM did one on funny men; I wonder if the focus wouldn't be more on comedy teams instead of individual comedy actors like the ones you mention. Of course the reason TCM didn't focus on women comedy teams is because there really wasn't any that came close to the type of recognition that the male teams did (which was why I mentioned the pairing of Todd and Kelly, Todd and Pitts). I would have liked a to see a Thelma Todd film in there, as well. If she had lived longer, I think she perhaps would be spoken about more often. Also, I'm surprised no Betty Hutton film is showing. She was kind of a friend of TCM, wasn't she? I'm looking forward to HIGH ANXIETY. Anything with Madeline Kahn has my thums up. EXCELLENT! This is the way I'd like to see TCM program, at least some of the time. The programmers at TCM just got a freebie. They should be giving the contributions of this forum more respect, and do something with the spam. Uh Oh! Looks like I'm cross threading.